Download the free font here or visit www.nyctrees.org to write with Trees. While artist in residence with the New York City Urban Field Station, Holten created the New York City Tree Alphabet as a way to increase ecological literacy about climate change, urban conservation, and local engagement with Nature. The project grew from Holten's book About Trees (2015) and her public artwork Tree Museum (2009) which linked trees with community members telling their individual stories and was commissioned by NYC Parks, The Bronx Museum of the Arts and Wave Hill to celebrate the centennial of the Grand Concourse in 2009. Ten years later, in 2019, we will plant trees using the New York City Tree Alphabet to tell stories. 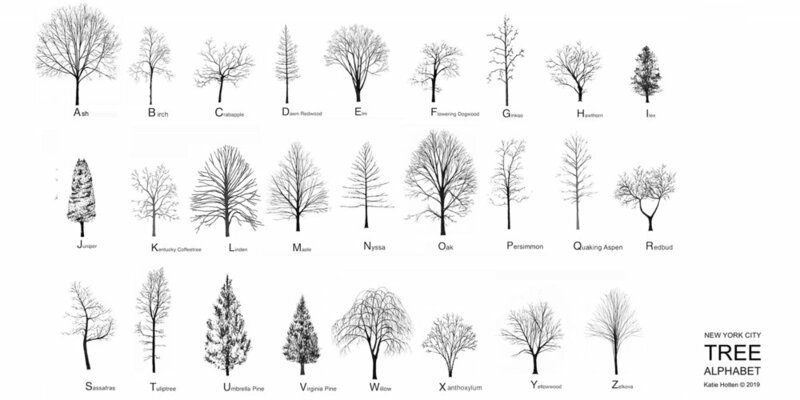 Katie Holten is the creator of the New York City Tree Alphabet and retains copyright. Sharing the New York City Tree Alphabet at the Children’s Museum of the Arts, January 25, 2019. Sharing the New York City Tree Alphabet during a tree planting session with the NYC Parks Department in Pelham Bay Park, Bronx, NY, April 28, 2018. Sharing the New York City Tree Alphabet with young members of Bloomberg during a tree planting session with the NYC Parks Department in Pelham Bay Park, Bronx, NY, April 28, 2018.